Time : 0.00 a.m. to 1.00 p.m. The message to create a Sri Kaarthaveeryarjuna abode came to Swamigal when he was travelling to Bangalore. He was on his way to Shirdi, via Bangalore, travelling by train with a group of 25 people. He got a call at that time from a person named Jabalpur Nagaraja Sharma offering to help him visit the original Sri Kaarthaveeryarjuna temple. Accepting the offer, but not having the idol ready, he had ayantra created immediately and went on to visit the original shrine of Sri Kaarthaveeryarjuna within the Fort of Ahalya Bai in Maheshwar near Ujjain. He went ahead with the idea of installing this yantra, but, as has happened many times before, someone offered to get an idol of Sri Kaarthaveeryarjuna made to be installed at the Danvantri healing centre Sri Kaarthaveeryarjuna is the presiding community energy (kula deivam) of all people belonging to the Atreya gotram. Here, He is depicted wearing mojris (a type of footwear used in North India) on His feet, as He hails from North India. He is the restorer of lost property. He is regarded for the four roles He played during his time: a King, a devotee, a protégé of the virtuous and brave Arjuna and as an aspect of Maha Vishnu Himself. When the Kaarthaveeryarjuna idol was to be installed, a question arose as to how He ought to be represented. Swamigal put this question to the deity. How do You want me to represent You? The answer came in a flash; ‘In green marble. My 1000 hands are meant to banish a 1000 unhealthy thoughts. Represent these 1000 hands with 16 hands that depict the 16 types of perishable, albeit restorable wealth.’ The wealth referred to here are: fame, knowledge, courage and strength, victory, children, valour, gold, valuables and gems, grain in abundance, happiness, bliss, intelligence, beauty, higher aim, higher thinking and high order of meditation, morality and ethics, good health and long life. 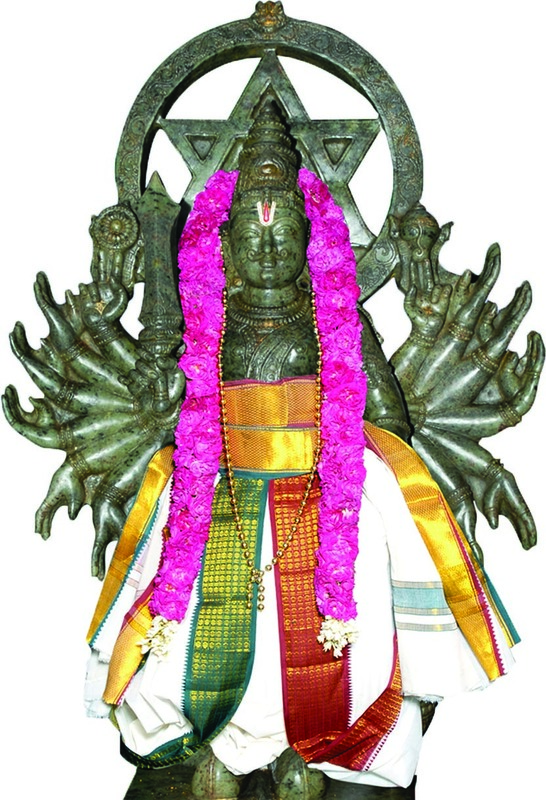 Kaarthaveeryarjuna was an ardent devotee of Lord Dattaatreya. He fought against Parasurama and was defeated. He was unfazed by the mighty Ravana. During the karikolam, Swamigal visited the residence of a gentleman who requested permission to invite his family priest to meet him. Swamigal, who doesn’t conform to traditional conventions and preferred not to engage in controversial discussions. However, he had to oblige his host and so agreed. Much to his surprise all his anxieties were unfounded. The priest agreed with Swamigal’s perspectives. Interestingly, he mentioned how Kaarthaveeryarjuna helped locate his lost car. This conversation led Swamigal to reckon Kaarthaveeryarjuna as a restorer of lost wealth of which health is supreme.